Since having my girls, I have not taken many holidays or breaks by myself. 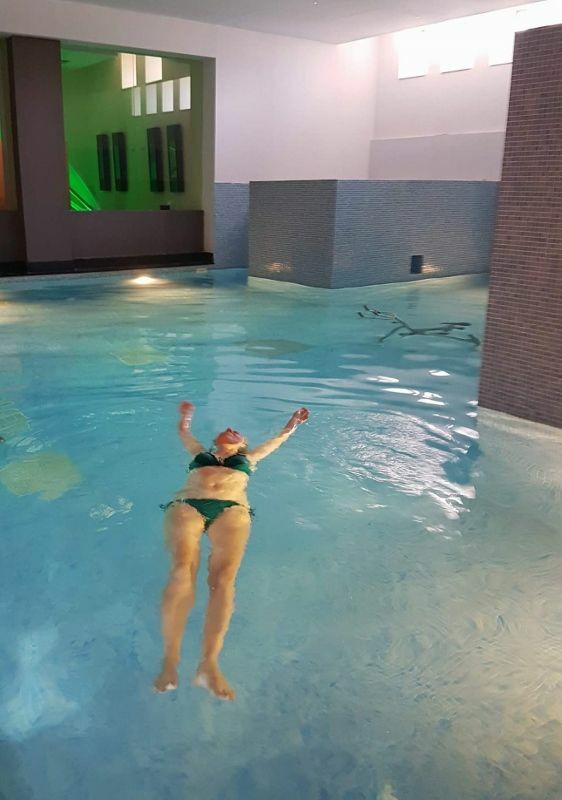 So when my friend Chrysoula asked me to join her to Out of the Blue Capsis Elite Resort in Crete, I did not need to think twice. 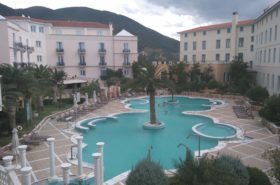 A girlfriend weekend escape to a luxury resort on a Greek island was everything that I needed after a busy school year. The thought of sleeping past 7am, eating well by myself and taking a bath without someone knocking on the door was a dream come true. The fact that Out of the Blue Capsis Elite Resort hosts a first class award winning wellness center made me jump from joy. I much needed to feel healthy again and leave my hectic life in the big city behind. Long stretches of quiet and some ‘me’ time was finally waiting for me. Euphoria! We had an amazing time at Out of the Blue Capsis Elite Resort. The resort is beautifully located on a private green peninsula in Agia Pelagia surrounded by a turquoise blue Aegean Sea. The suites and private villas are sensational and the food and services exceptional. You can find everything about our experience here. This post is about the spa at the resort. Euphoria is a Greek word. It means ‘psychologically uplifting or extreme happiness’. The Euphoria Rejuvenating Spa is located in the main building of the privately gated ‘Exclusive Collection’ section of the resort. 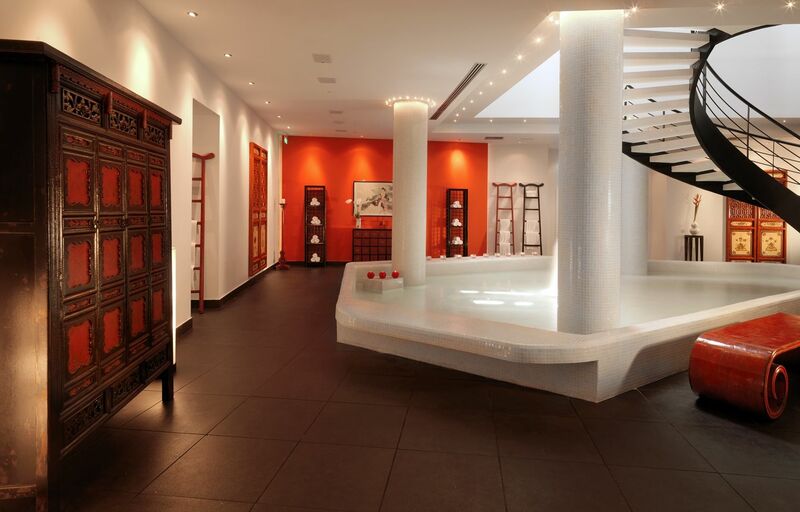 Hi-tech innovative features such as a Wellness Capsule are combined with classic red and white and Chinese and Oriental elements. They style and character of the spa is cozy and warm. Other unique treatments on the Euphoria menu are Colon Hydrotherapy, cleansing the bowel and hydrating the body. Cretan chocolate and Cretan olive oil and herbs are used for massages and wrappings. Several no-needle therapies are offered for anti-aging. You can also book a massage in your villa or in the nature and next to the sea (Massage by the Sea 20min. 35 Euro). I had a manicure, the Short Facial Regenerating & Hydrating Treatment by Valmont (35 min. 70 Euro) and the 50 min. Body Massage (85 Euro). The massage was wonderful relaxing and the facial was fantastic too. I loved the use of the Valmont products. Euphoria Rejuvenating Spa has been chosen by Valmont to be the only spa in Greece to join the VALMONT club des Spas de Prestige. 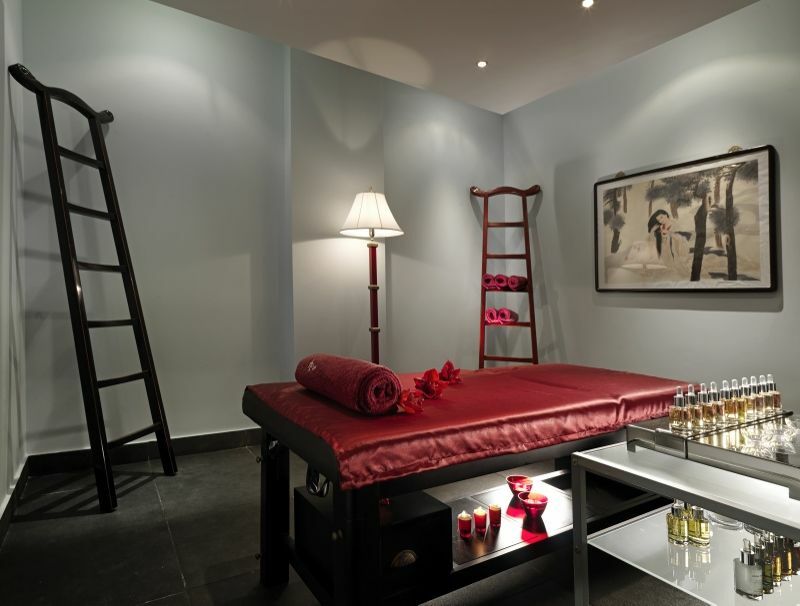 The treatment room was spacious and beautifully decorated. One of my favorite spots in the spa is the rest area next to the pool (pictured at the top of this post). It is a perfect place to read a book, to just zone out or have, some tea before or after a treatment. The cave inside the swimming pool with little lights changing colors was very soothing. Me and my friend also tried the hammam and sauna. These need a reservation thus preventing too many people being present at the same time. I am dreaming away in the pool after my treatments. The spa was truly a place to relax and escape! ‘’the emotional, mental and physical well being of our guests is central. The focus is on health, weight, stress reduction and detoxification’’. These goals can be reached through nutritional and detoxification programs, holistic treatments and therapies as well as (non invasive) aesthetic treatments. Euphoria Rejuvenating Spa works exclusively with the world famous French Dukan method. Out of the Blue Capsis Elite Resort is the only hotel in Greece with this program. In the Dukan method there is no starving, no fasting and no restrictions. Imagine going on a vacation and be 2 or 3 kilos thinner after it! With the Dukan Diet and the Detox programme a weight loss is guaranteed. Because the nutrition programs and the Dukan diet are applied everywhere in the resort. Think of your mini-bar and room fridge: they will be adjusted to your specific nutrition program. And all restaurants in the resort (including breakfast restaurants) offer choices and dishes that are compatible with the (Dukan) diet. The constant support of the team and a special coach can help you to relax and enjoy a holiday instead of thinking of what (not) to eat and counting calories. It sounds ideal to me! There are special nutrition programs for kids. It is finally worth mentioning that the resort grows its own organic produce. The Capsis Detoxification programs use organic food from the resorts greenhouses. 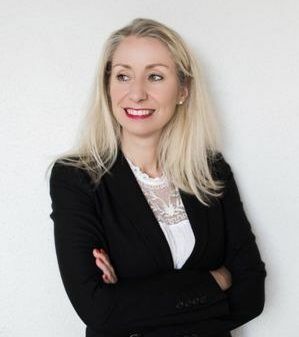 The range of medical aesthetic treatments ranges from non-invasive therapies such as Ultherapy, Cryo Lipolysis, Mesotherapy (no downtime required) as well as general treatments such as Botox, fillers and Ellansé. Sleep is a very important part of any hotel business. 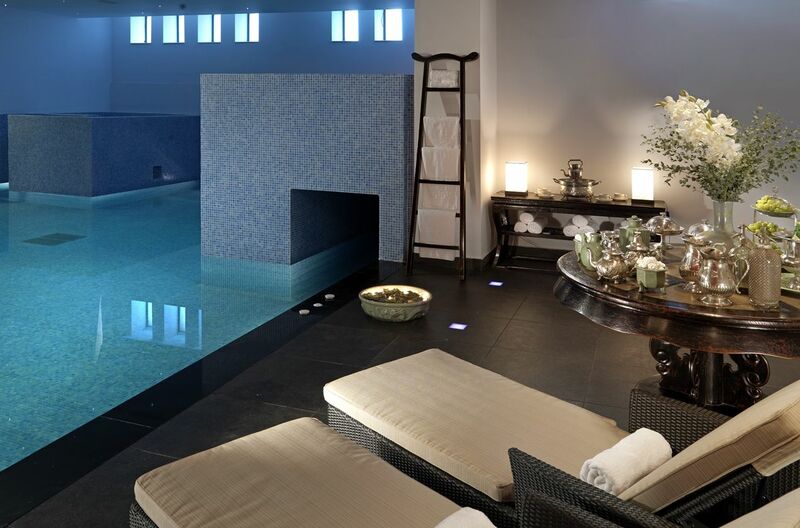 At the spa of Out of the Blue Capsis Elite Resort, it is possible to focus on sleep and sleep problems. By actually monitoring and analysing your sleep pattern in your suite (a special device used under the matras), the spa helps you to detect possible problems, resolve them and get the most optimal rest possible. 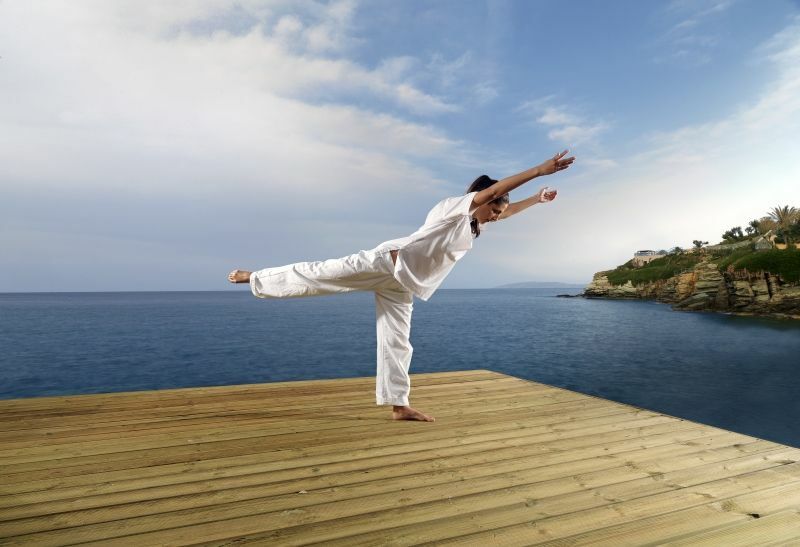 Thus, the Out of the Blue Capsis Elite Resort offers an innovate and complete wellness programme; a combination of nutrition, psychological support, yoga programs, medical spa and body treatments. A family resort with spa treatments and entertainment for the offspring seems like the perfect solution for any exhausted parent. Out of the Blue Capsis Elite Resort offers an amazing entertainment programme for babies, kids and teens. I wrote about it in my previous post. Leave your baby with the qualified nannies and childminders at the play area and enjoy your whole day in the spa. The Minoan Entertainment Park is open from 10am to 6am and in the evening there is a children disco. You can experience a whole day at the spa whilst your kids are supervised, fed and entertained. Parents happy, kids happy! If you are in need of a detox period or weight loss or if you need just some time off; Euphoria Rejuvenating Spa Out is your destination. 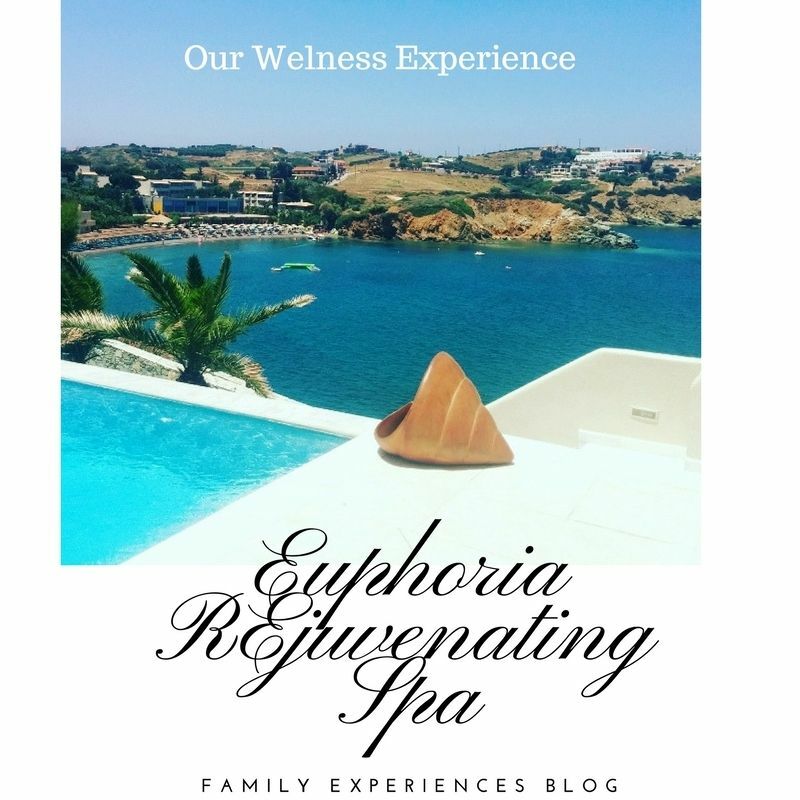 Do you want to combine your family vacation with some much deserved spa time, head over to Out of the Blue Capsis Elite Resort. It is the ideal wellness resort for those who want total relaxation and rejuvenation combined with the essence of luxury and tranquility. 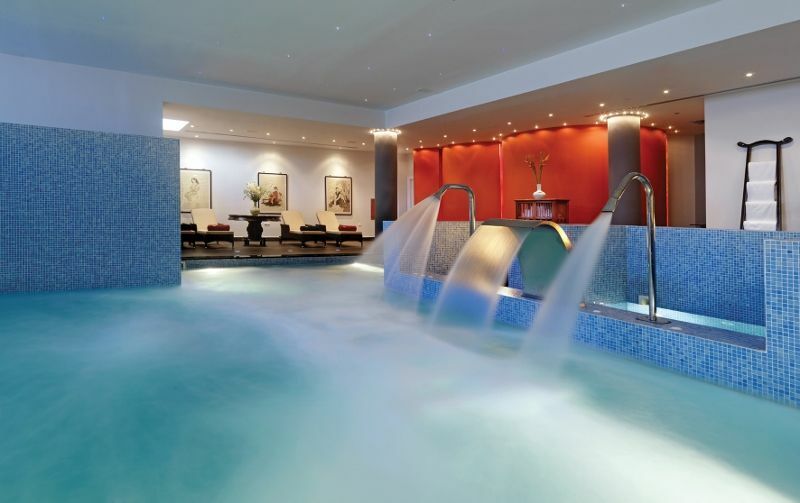 This spa is also perfect for a corporate trip or (girlfriend) weekend break close to Athens. 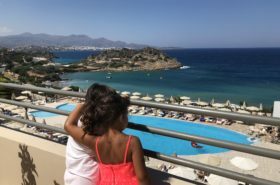 The flight from Athens to Heraklion International Airport takes no longer than 40 minutes followed by a 20-minute car ride to the resort. The spa operates daily from 10 am until 6pm-8pm. Children under 14 years old are not permitted in the spa. 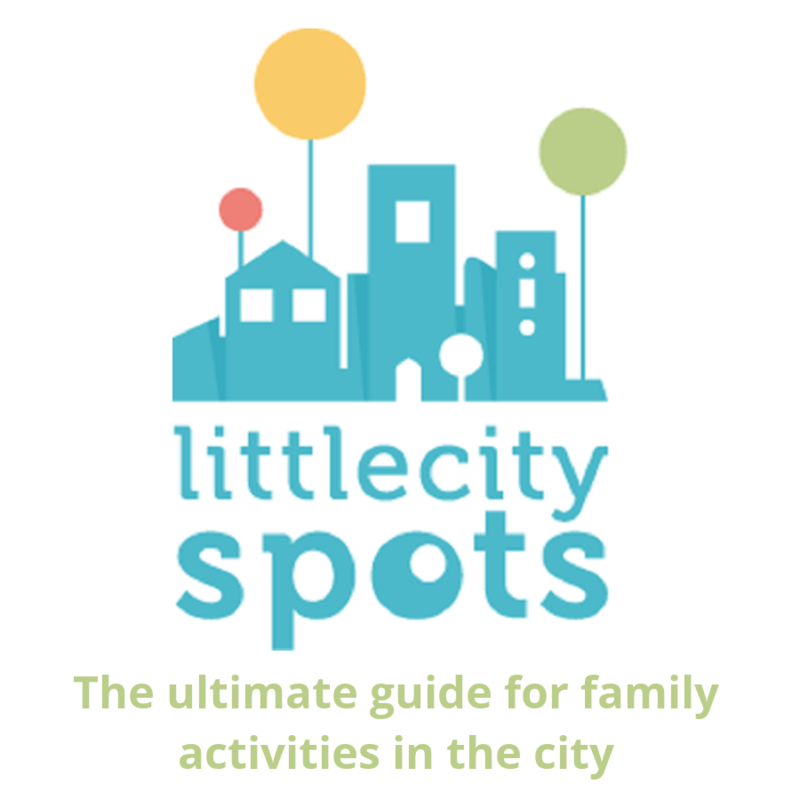 Chilling with kids or looking for the ultimate spa holiday? Pin this post for later!